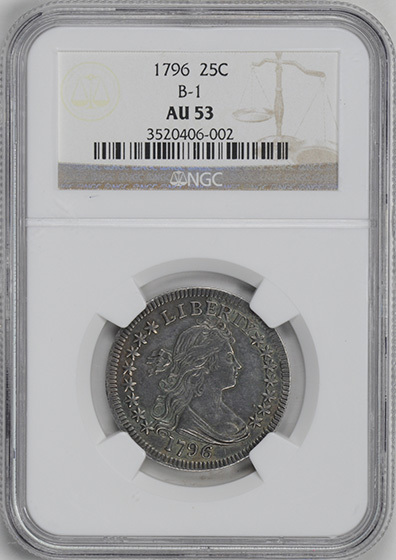 Heraldic Eagle quarters are exceedingly scarce in mint condition and all but unheard of in grade levels above Mint State-65. 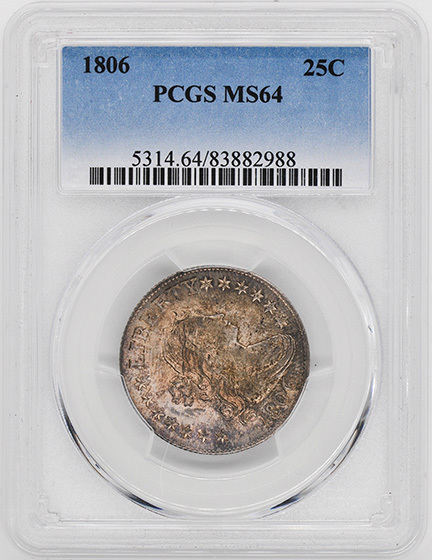 Areas on this design to first show wear are Liberty’s bust and shoulder and her hair above the forehead. 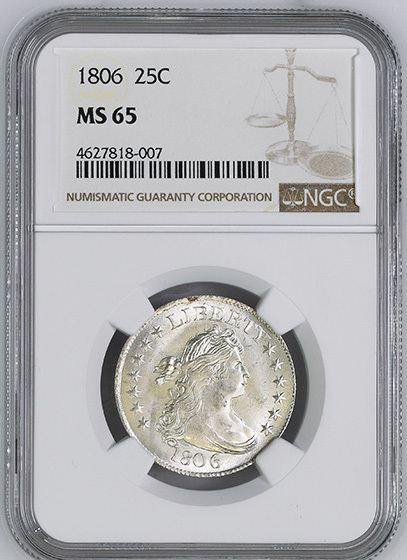 On the reverse, check the eagle’s head and the tops of the wings.A complete date-and-mint set actually includes five coins, since 1806 quarters come with both a normal date and a 6-over-5 overdate. 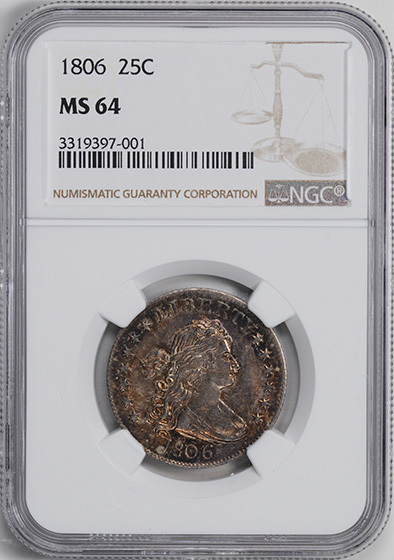 Although it wouldn’t be an impossible task to assemble a set of all five issues, many prefer to treat this as a type coin and acquire just one high-grade example to represent the series as a whole. 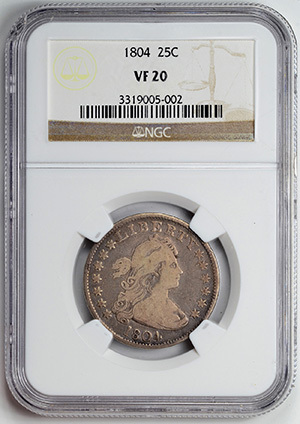 For those quarter devotees who prefer complexity to simplicity, Ard W. Browning published the first variety study of these coins in 1925. His pioneering book has been superseded by a much better researched and illustrated 2008 volume by Steve Tompkins, though the Browning numbering system is still employed today. VERY RARE. ONLY 6,738 STRUCK. GEM WHITE FLASHEY LUSTROUS SURFACES. 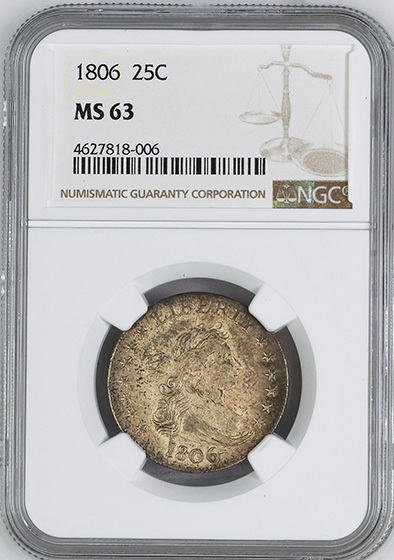 ONLY ONE COIN GRADED HIGHER.